The environmental review for one Alaska natural gas pipeline is complete. The U.S. Army Corps of Engineers released the final supplemental environmental impact statement for the roughly $10 billion Alaska Standalone Pipeline project, or ASAP, on Friday morning with a short list of options for smaller, in-state gas delivery proposal. The final supplemental EIS was originally scheduled to be out in March. Alaska Gasline Development Corp. Senior Vice President Frank Richards said in a prepared statement that although only one can be built, AGDC is advancing parallel gasline efforts for ASAP and the Alaska LNG Project at the direction of the Legislature and that both projects have benefitted from data sharing with similar impacts along the pipeline routes. The much larger Alaska LNG Project would require expansive gas treatment and LNG plants on the Slope and in Nikiski, respectively. ASAP needs a North Slope gas conditioning facility, but does not include a terminal LNG plant given there are no initial plans to export gas from the project. “The final SEIS for the ASAP project sets the stage for AGDC to build a pipeline from the North Slope of Alaska and better positions the Alaska LNG Project for success. AGDC will leverage this federal approval in our work with the Federal Energy Regulatory Commission to advance the Alaska LNG Project expeditiously as the federal agencies are now intimately familiar with the environmental conditions along this common alignment,” Richards said. As AGDC’s regulatory lead, Richards has advocated for FERC to utilize the Corps’ evaluation of the wetlands impacts of ASAP in its drafting of the Alaska LNG EIS, which is ongoing. AGDC notes the pipeline corridors for Alaska LNG and ASAP are virtually identical and therefore evaluation of the route does not need to be duplicated. The primary differences in the two pipelines is the line for the ASAP project, meant for in-state gas use, is 36 inches versus the 42-inch Alaska LNG pipe and would stop near Big Lake in the Matanuska-Susitna Borough. The Alaska LNG line would continue south, cross beneath Cook Inlet and end at the LNG plant in Nikiski. "This is yet another milestone for the Alaska Gasline Development Corporation and further proof the federal government is committed to making sure the Alaska LNG Project moves thorugh regulatory processes expeditiously," Walker posted on his Facebook page June 22. "Thanks to AGDC's staff, Board Chair Dave Cruz, and President Keith Meyer for working hard to make this happen!" The ASAP project is commonly referred to as the state’s “backup plan” to pull natural gas off the North Slope. Its genesis predates even the concept of the commercial export Alaska LNG Project being pursued by Gov. Bill Walker’s administration with support from BP. Accessible Cook Inlet natural gas reserves that heat and power much of Southcentral Alaska were dwindling in 2009 when the Legislature formed AGDC as a wing of the Alaska Housing Finance Corp. The subsidiary of the state mortgage bank was tasked with developing a project plan to provide North Slope gas for in-state use. The AGDC-AHFC in-state pipeline work culminated in late 2012 with a design and final EIS for a 737-mile, 24-inch high-pressure pipeline also capable of carrying natural gas liquids from the North Slope to a tie-in to Southcentral’s gas network just north of Wasilla at rough cost of $7.7 billion. The capital cost for the pipeline, a 12-inch offshoot line to Fairbanks and a gas conditioning facility on the Slope did not fully address financing mechanisms that could’ve added to the $7.7 billion estimate depending on how the project was funded. In the spring of 2013, legislation was passed to stand up AGDC as a separate state corporation. It also included a $355 million lump sum, which funded a revised ASAP plan — what AGDC is working on now. The latest iteration of an in-state pipeline is a lower pressure, 36-inch buried pipeline to carry utility-grade natural gas that is ready for a wider array of uses. As designed, ASAP would carry up to 500 million cubic feet of gas per day. With current in-state consumption at about 250 million cubic feet per day when averaged over a year, project officials have said the excess capacity could supply new resource or industrial developments along the pipeline corridor. The Alaska LNG Project has a planned daily capacity of about 3.5 billion cubic feet of gas per day. Overall, the two alternatives for the 36-inch pipeline plan vary little; they follow the same corridor from the North Slope to the Point MacKenzie area except for a roughly seven-mile stretch where the pipeline would skirt the edge of Denali National Park. AGDC proposed a route that runs just east and outside of the Park along the short section of the Parks Highway that is inside the Park boundary. The Corps drafted an alternative that more closely aligns with the highway through the Park because of 2013 federal legislation authorizing a pipeline route through parts of the Park, according to the final EIS. Additionally, the Corps evaluated the prospect of an above ground pipeline for the first 62 miles coming off the Slope as well as an aerial crossing of the Yukon River. 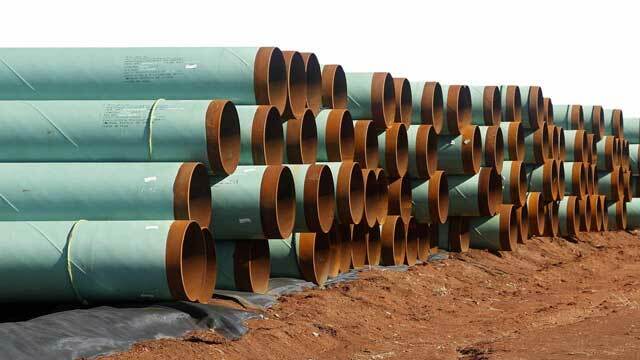 Corps officials wrote that other agencies participating in the supplemental EIS expressed concerns about burying the pipeline along the Arctic coastal plain. “If the active layer of insulation is disturbed during construction (i.e., trenching), permafrost could be vulnerable to thermokarst and subsidence during the summer due to exposure to higher temperatures. In addition, [the] U.S. Fish and Wildlife Service specifically requested consideration of elevating the pipeline on vertical support members for the first seven miles through the Arctic coastal plain where ice-rich, saturated soils and continuous permafrost are found. The first 30 miles in particular contain a high density of oriented thaw lakes, which provide important habitat for North Slope species,” the document states. Unlike other federal agencies, the Corps does not issue its recommendation on which, if any, project alternative should be advanced until a record of decision is issued after a mandatory 30-day public review period for the final EIS.